A Christian mother was today branded 'homophobic' after claiming live on TV that being gay is a choice and nobody is born homosexual. Izzy Montague, of Croydon, South London, claimed during a debate on LGBT lessons in schools that her beliefs prevented her from having a gay relationship. 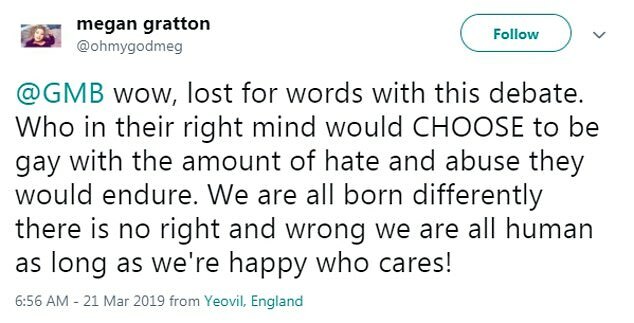 But she was criticised by some viewers of ITV's Good Morning Britain, who claimed she was 'bigoted' and 'from the 1500s' with 'absolutely disgusting' views. 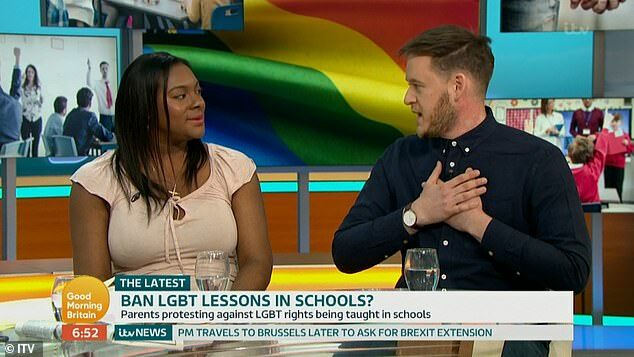 Gay father Tom Cox, who is a blogger, appeared alongside her on the programme today and insisted that people are born with their sexual preference. But Ms Montague said: 'I don't agree with that you're born, you know, anything, no. Of course I believe it's a choice. I've made a choice on what I think is right or wrong. 'I don't remember ever thinking to myself 'am I gay, am I straight?' It's something that I have done based on how I believe. Mr Cox added: 'I think you're doing a child a disservice by not allowing them to have that education to see that families come in all different shapes and sizes. 'We live in such a diverse time. Gay people are everywhere, so they're going to get on a bus and that bus driver is going to be gay. However, Ms Montague then said: 'What makes you think that my child is going around in a world thinking that nobody is gay? 'I never said that I would not teach my child. I'm Christian, so we have our own ways of teaching about the world - it's not about living in a vacuum. 'It's not about saying this person doesn't exist, it's nothing like that. It's our opinions of the world around us. 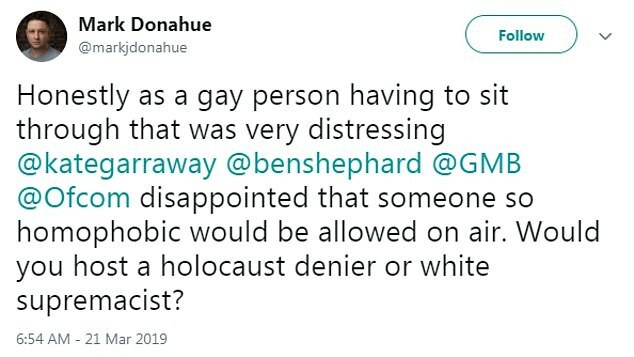 Viewers of the show hosted by Ben Shephard and Kate Garraway were quick to criticise the woman on Twitter, labelling her 'blatantly homophobic'.